Being a fan of David Allen’s GTD (Getting Things Done), the task management capabilities of e-mail are a necessity for me. In the perpetual Gmail beta, task management or the to-do list has been sorely missing. Posted Monday in The Official Gmail Blog, the Gmail team shared the details of the addition of this feature. The lack of task management in Gmail has been one of the key missing features for enterprise class e-mail solution. Gmail’s first iteration of task management is pretty “lightweight” – as described by the Gmail team in their blog. Once it is enabled (through Settings), a link is provided in the left hand column called “Tasks.” Clicking the link opens a task list window in the lower right hand corner. If you click the arrow in the upper right hand corner, it opens the list in a separate browser window as a pop-out. This is how I prefer to use it at the moment, although I am still trying things out. 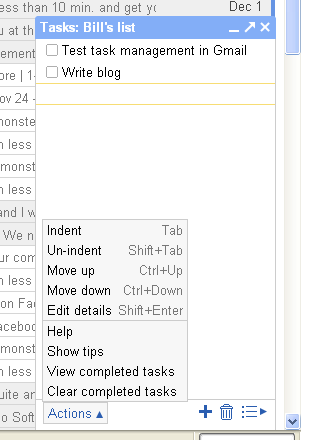 Tasks are created by simply typing and hitting enter. You can indent (to create a visual sub-task), move up and down, and add details (such as a due date). The most useful feature is the ability to convert e-mails to tasks. Select a message, go to More Actions > Add to Tasks and a task is created with the title of the e-mail. A link to the e-mail is provided below the task name that takes you to the message without closing the task window.